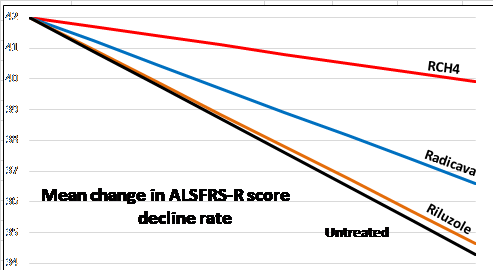 It should be noted that although the ALSFRS-R score is the gold standard for decline measurement, it does not include factors such as get-up-and-go, strength etc. It should also be remembered that the ALSFRS-R score may not reflect loss of motor neurons. However, it is logical and true to observe that, for example, if the ALSFRS-R score does not change, then end of life would be due to something else - or extreme old age. The monthly monitoring reports also track the drugs and all dietry supplements taken by PALS who are being treated with RCH4. We do not recommend taking supplements without you specifically discussing the topic with your doctor. Note: in March 2018 `Patients Like Me` (PLM) deleted more than half of all RCH4 evaluations and closed more than half of the accounts of members who take RCH4. This was an ill advised and unfair response to totally untrue and malicious reports from certain other PLM members alledging that RCH4 is a "SCAM"
A limitation of clinical trials is that participants are characterised by a less severe form of ALS or are early in the disease progression due to the exclusion criteria customarily imposed on partisipants in clinical trials. Actual population-based data does not have this limitation and more accurately reflects the true efficacy of any drug. RCH4 data is from whole treated population. There are no exclusion criteria - all are accepted if the charity has funds available. Some PALS are being provided with, or sold, a substance which may be counterfeit Radicava (also known as Edaravone) and are being supplied by "reputable" on-line entities. Whereas Edaravone is a component of Radicava in modified form, it is not Radicava. Some PALS who have taken counterfeit Radicava in the past, subsequently develop a reaction (short term itching) to RCH4. Refer to the `Molecule` link below.